Website security provider and domain registrar to offer new options to small and mid-sized businesses. SiteLock LLC, a global leader in website security solutions for online business, is pleased to announce its plans to join forces with eNom, the world’s largest ICANN accredited wholesale registrar. eNom, Inc. manages a network of 8,800 resellers globally. Resellers primarily join eNom’s reseller program for domain registration services but also have the option of reselling many other online tools services such as hosting and email. The partnership with SiteLock will allow eNom to offer malware removal, blacklist monitoring, website security, and web application scanning to its Reseller channel. The introduction of SiteLock will expand eNom’s current security portfolio, which is focused primarily on SSL certificates. Tom Serani, Executive VP of Business Development at SiteLock, sees this as a promising partnership. ”eNom and SiteLock both understand that the importance for online security products is greater than ever, and we are thrilled to take part in this venture together,” he says. For additional information about SiteLock security solutions for online businesses, visit sitelock.com. For additional information about eNom domain and hosting technology and services, visit enom.com. Established in 2008, SiteLock (http://www.sitelock.com / @SiteLockSecure) has helped small businesses protect their websites and reputations through website security services and scanning. SiteLock offers the most affordable and complete website security solution available on the market, protecting against malware, spam, viruses and other forms of threats from hackers. SiteLock’s Expert Services team can remove malware and harden website platforms to help prevent future attacks. SiteLock currently protects over 500,000 customers worldwide and scans over 2 million web pages daily for threats. 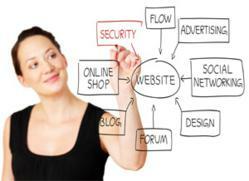 Many of these customers are online merchants that rely on their website as their business storefront. Each subscription to the service includes SiteLock’s Trust Seal, which is proven to increase sales and conversions by more than 10%. SiteLock is headquartered in Jacksonville, Florida and has offices in Scottsdale, Arizona and Boston, Massachusetts. For more information, call +1.877.257.9263 or visit sitelock.com.